To join any branch of the military -- including the Army, Marines and Air Force -- you need to be in top physical condition. Getting in shape for the service is a process that takes time. You will need to start well before basic training. Depending on your current fitness level, it might take months or up to a year to get in shape for the service. Becoming physically fit for the military involves cardiovascular training, strength training and maintaining a healthy diet. Eat healthy. To prepare yourself for exercise and basic training, eat a healthy, well-balanced diet. A healthy diet can help fuel your body -- include plenty of protein and carbohydrates for energy. To keep your body fueled, eat five to six small meals per day. Meals should include fruits, vegetables, whole grains, lean meats and low-fat dairy products. Keep yourself hydrated. As you get in shape, be sure to drink plenty of water. The National Academy of Sports Medicine recommends eight glasses of water per day. Water helps keep you feeling full and replenishes your muscles after a workout. Build up your endurance. Cardiovascular exercise can help increase your endurance and stamina. The American College of Sports Medicine recommends 30 minutes of cardiovascular exercise, five days per week, for weight maintenance. For weight loss, you should participate in 60 to 90 minutes of exercise most days of the week, although this varies from individual to individual. 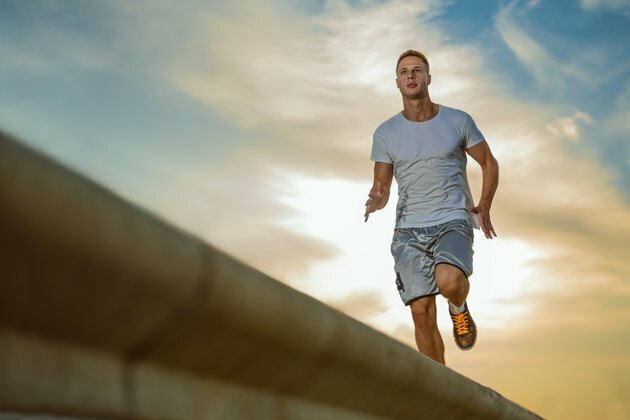 Cardiovascular exercise can include swimming, running, sprinting (especially when mixed with lower intensity intervals in the same workout), cycling, aerobics, and brisk walking. Strength train. Strength training can help tone your body and build muscles, thus preparing you for the physical demands of joining the military. Use weight machines and free weights to strengthen your upper and lower body. Perform body weight exercises -- exercises that use your own body weight to build strength -- including pushups, lunges, situps, pull-ups / chin-ups, crunches, planks, reverse crunches and squats. Participate in strength training two to three days per week on nonconsecutive days to ensure muscle recovery. Visit with your doctor. Before joining the military or beginning an exercise regimen, you will need physical clearance from your doctor.